The premium earbuds by Jabra are worth purchase. Jabra elite 65t is a pair of wireless earbuds. These are being called the “true” wireless earphones as they need to be plugged into a charger after usage. The earplugs are available in three colors- Titanium black, copper blue, and copper black. The earplugs cost INR 13,499but are available at a price of INR 12,099 on Amazon.com. Jabra has proven its track record of providing best quality sound systems with its third generation Elite 65t model. These latest earbuds have a smart built and weigh 322 grams. They come packed along with a charging case, Micro USB Cable, 3 pairs of silicone gel earbuds, Warranty, and a User Manual. The Jabra elite 65t earplugs come with a four microphone technology that allows you to have easy conversations because of the excellent sound clarity. They deliver remarkable performance and can be called of its kind. If you like adding extra effects to your music, you will be glad to know that these earbuds come with a customizable equalizer. The things become more interesting when artificial intelligence is involved in the form of Amazon Alexa. The one touch Alexa feature helps you to listen to your favorite playlist, set alarms, and get all the information you need, with just one touch. The third generation earbuds by Jabra have a satisfactory battery life of approximately 5 hours. Thereafter, you can charge its three Lithium ion batteries with its pocket friendly case. This extends their life to 15 hours straight, so you can enjoy your music non-stop. These earbuds have an IP55 rating and they are guaranteed to last for a long time. They are compatible with Bluetooth devices and possess a microphone. 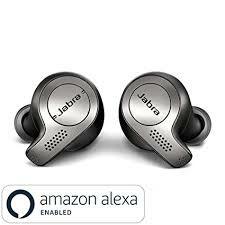 The earbuds have a 1 year warranty by Jabra and 2 years warranty against dust and water. The right earbud can be used as a mono piece to make calls. The silicone buds are available in three sizes and provide a pretty good isolation from noise. The users have appreciated the voice feedback provided by the earbuds. Mostly all the functions are associated with the right bud. You can play or pause your audio, pick calls, and do much more using the right earbud. Its left counterpart can be used to control volume and change tracks. The best thing about this elite model by Jabra is that while on the street you can forget all the unwanted noises, stutters, and commotion. So if you are looking for wireless earplugs then these are worth a try. You can buy these at the best price at Amazon.com.